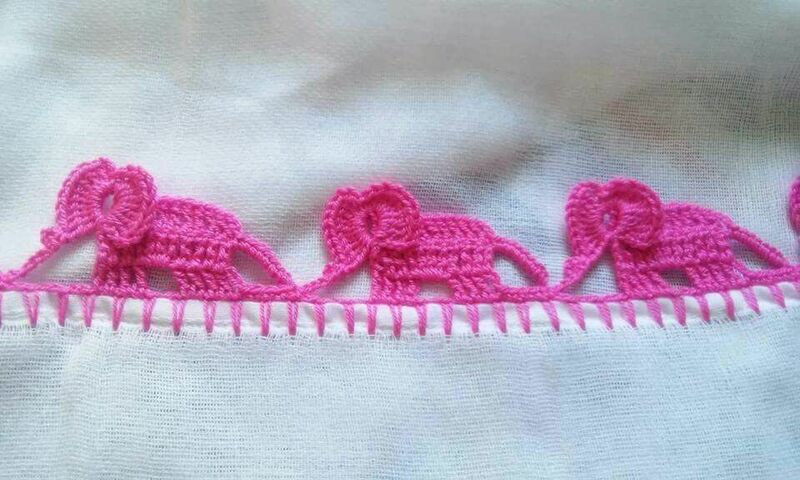 Hello crocheters, today I will share with you that edge of beautiful and creative crochet. This crochet edge is shaped like an elephant. Very beautiful. A crochet edge well done gives a perfect finish to any piece. Transforms a single piece in a unique and delicate piece. Scarves, blankets, dishcloths and even bought ready-made parts are valued by the texture and color of a crochet edge well done. So check out the video with step by step this edge of beautiful crochet edge. PRECIOSO, MUCHAS GRACIAS POR COMPARTIR. ¿Hay alguna manera de conseguir esto en Inglés ? Y ¿Dónde puedo obtener el patrón? Gracias, muy lindo y fácil de hacer!. Could you please give the translation in English? I love this edging and really want to use it for a great granddaughter expected this November. My granddaughter loves elephants and this is perfect. I can't read symbol charts yet, but could transcribe the instructions from a English video. Thanks.